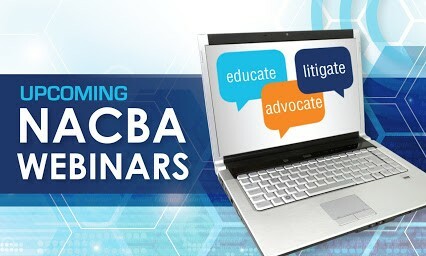 REGISTER FOR NACBA’s LIVE WEBINARS! Presenters: James Haller, Esq., Marc Dann, Esq., & Ahmad Sulaiman, Esq. Would you like to increase your income in your bankruptcy cases while providing extra services to protect your clients? Our panelists will discuss a checklist of factual scenarios that may result in additional lawsuits against creditors or debt collectors. They will review what to look for in FDCPA, TCPA and FCRA cases and the statute of limitations. They will give guidance on how to prosecute or refer claims. Finally they will discuss when it is best to review cases for these possible lawsuits (pre vs post-petition vs post discharge). Join us and learn how to recognize these claims. Presenters: James Haller, Esq., Daniel Press, Esq., & Summer Shaw, Esq. Join our popular quarterly program where you get to ask your bankruptcy law questions to our panel of experts. We will start with questions unanswered from our last session (see below) and take your questions. See if you can stump our chumps..
in Bankruptcy Court and 341 Meetings. Have you ever used coverage (or appearance) counsel to represent your clients? Have you ever stepped in to help a colleague who can’t attend Court? Mr. Lofland routinely appears as coverage counsel in hundreds of cases and has spoken about this issue in April 2017 for the Chicago Bar Association. He will outline and discuss the legal and ethical requirements for appearance counsel.